It’s not enough to know what tech devices are capable of doing – to truly understand the market, what matters is how people actually use them. Consumers and employees have choices, and are increasingly juggling multiple devices. While some market segments use their various devices for a broad and rich combination of activities, others prefer to do certain activities only on one type of device. Furthermore, many Connected Adults use personal devices for work-related activities and vice-versa. This chapter includes a full range of activities-related answers selected from the many questions in the comprehensive TUP survey. The sections number eight: Social Networking, Shopping, Communication, Entertainment, Graphics/Imaging, Information/Search, Cloud Storage/Sharing, and Personal/Productivity. The data-rich deliverable is designed for quick recognition of important findings, including statistical testing and indexes comparing values to their national averages. This report covers many key topics: user and household demographics, activities (major and by category), device activities (PC, Smartphone, Tablet, Basic cell phone, Game Console), and technology spending. This document includes over 2,000 pages in PDF and Excel, featuring cross-tabulations which may be used for market sizing, user profiling, benchmarking, and to support many decisions. Please also refer to the many other chapters and sections of TUP. For each of the above activity sections, there is a further breakdown of the breadth of activities used, the primary device types for each activity type, and the Operating System of the primary device for each activity type. Do the most active on social networks favor wearable technology? Are Smartphone social networkers different from Desktop social networkers? What is the profile of the most active in social networking activities? What is the profile of the most active in shopping activities? What is the profile of the most active in communication activities? What is the profile of the most active in entertainment activities? What is the profile of the most active in graphics & imaging activities? What is the profile of the most active in information & search activities? What is the profile of the most active in cloud storage & sharing activities? What is the profile of the most active in personal & productivity activities? 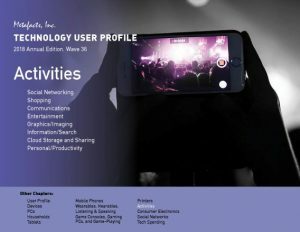 How primary is game-playing and entertainment activities for connected devices? Do Tablet, PC, or Mobile Phone gamers use their connected devices for the broadest number of entertainment activities? Are social networkers more or less active with their tech devices? Are many Work PCs being used for Social Network activities? Which is the primary device used for social networking? Are some social network’s users more active bloggers or commenters? Which devices are used for the broadest range of social network activities? How much more broadly are Smartphones used than Basic cell phones? How similar are the major activities for Smartphones and Basic cell phones? Are Smartphone users simply more active with their connected devices than others? What’s the major type of activity not enjoyed by Verizon customers as by others? Which market segment has the highest incidence of remote printing activities? Which market segment has the highest incidence of cloud sharing activities? Which OS family of Tablet PCs is used for the broadest range of activities? Which PC activities are done more often among Home PC owners without kids than with kids? How are printing patterns different among the most-mobile users versus other users? Which segment uses their devices for the most productivity and personal activities? Which segment has over half of its members using a connected device to read newspapers or magazines? Which segment is clearly the most active in using Cloud Storage or Sharing? How many users make phone calls or texts using their PC? How many users make video phone calls using their PC? How many users make video phone calls using their Tablet? How many users make video phone calls with any of their devices? How many users make video phone calls using their Smartphone? Who uses their PC to watch television? 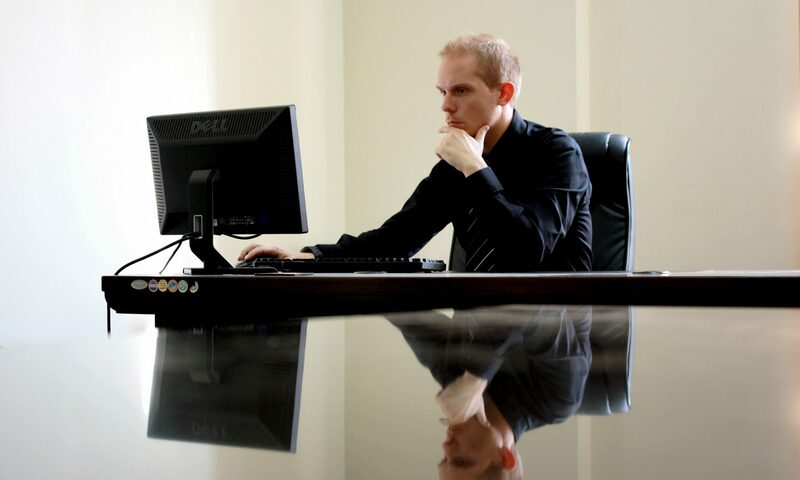 How many employer-provided PCs are used for personal activities? How are Notebooks used differently than Desktop PCs? How are Smartphones used differently than Basic cell phones? Are newer PCs used differently than older PCs? Are newer Smartphones used differently than older Smartphones? Are newer PCs used for more – or fewer – activities than older PCs? How are Tablets used differently than Notebook PCs? How are Smartphones used differently than Tablet PCs? What’s used for the most cloud storage & sharing activities from among popular combinations of devices? Which segment uses which device for their primary cloud storage & sharing device? Which device is used for the most cloud storage and sharing activities? Which device is used for the most communication activities? What’s used for the most communication activities from among popular combinations of devices? What’s used for the most entertainment activities from among popular combinations of devices? Which device is used for the most entertainment activities? Which segment uses which device for their primary entertainment device? How prevalent are entertainment activities with employer-provided PCs? What’s used for the most graphics & image activities from among popular combinations of devices? Which device is used for the most graphics & image activities? Which segment uses which device for their primary graphics & image device? What’s used for the most productivity & personal activities from among popular combinations of devices? Which segment uses which device for their primary productivity & personal activities? Which device is used for the most productivity & personal activities? What’s used for the most search & information activities from among popular combinations of devices? Which device is used for the most search & information activities? Which segment uses which device for their primary search & information device? What device(s) is/are used as the primary shopping device more so than Smartphones? What’s used for the most shopping activities from among popular combinations of devices? How prevalent are social networking activities with employer-provided PCs? Which segment uses which device for their primary social networking device? Which device is used for the most social networking activities? What’s used for the most social networking activities from among popular combinations of devices? Whose Home Printer customers use their devices for the broadest range of Graphics/Image activities? Which carrier has the highest share of the most-active Basic cell phone users? What are the major activities for Basic cell phones? What are Basic cell phones used for among the most-active users? Are Apple’s or Google’s best customers the most active across their various devices? How does the mix of device activities vary between Apple’s, Google’s, HP’s, and Dell’s best customers? Do color laser printer users use their devices for graphics or images more than average users? Among Home printer users, what is the preferred device for graphics/image activities? What are the main printer activities? What are the most common documents (maps, spreadsheets, photos, etc.) that consumers print on their inkjet printers? How about their laser printers? How many are using their home printer to print images directly from their Smartphones or Tablets? Are many users using remote printing services? Are these using their Internet-ready printers or online printing services? Which segments are using remote printing as a substitute for home printing, and which as an additional way to print? How many people use remote printing services?